►Assumption speech of MajGen Jovito S. Palparan Jr.
►What was Samar doing when MacArthur waded ashore 60 years ago? ► Death Penalty: Moral or Immoral? "Even if the victim intends to seek legal remedies for the violation of their rights and to prosecute the perpetrators, there is no law against torture..."
The Philippine government prohibits the use of torture as stipulated in its 1987 constitution. It is also a state party to the Convention against Torture and Other Cruel, Inhuman or Degrading Treatment or Punishment (CAT), but the government's failure to criminalise the practice of torture has virtually shielded the police, military and other public officials from prosecution for ordering or torturing others, thus creating an environment of impunity. Although the government's law enforcement agencies have denied the practice of torture by their ranks, reality in the country suggests otherwise. In most cases, allegations of torture are not investigated. Where there are allegations of torture, the burden to prove this claim rests on the victim. Even if the victim intends to seek legal remedies for the violation of their rights and to prosecute the perpetrators, there is no law against torture. There is also no institution that will look after the needs of torture victims. Consequently, the victims are left isolated, persecuted and traumatised, and they are frequently forced to face charges in court that are often the result of forced confessions after being tortured. There is a proposed law against torture pending in Congress in the Philippines-House Bill 4307 entitled Act Penalising the Commission of Acts of Torture and Other Purposes-that stipulates torture as a criminal offence. The bill covers a detailed proposal of how to address torture in terms of prevention, prosecution, rehabilitation and the indemnification of victims. The bill, however, has had difficulty passing into law. There is strong opposition from some government law enforcement agencies, public officials and even legislators regarding torture. Most of those who oppose the bill are critical of the captured insurgents, suspected terrorists, political detainees, militants and other progressive groups which comprise the victims of torture in most cases. Freedom from torture is perceived as more of a political issue rather than a basic human right. Although ordinary Filipino citizens also experience torture, most of these cases are not investigated, brought into public discussion or reported to the Philippine Commission on Human Rights, relevant police officials and the military ombudsman for investigation and sanctions. Society's poor understanding and inability to articulate that freedom from torture is a basic right is essentially the main factor as to why torture has not yet been considered a criminal offence in the Philippines. An average Filipino, in particular those victims of heinous crimes, still believe that torture is an effective way of investigation and initial punishment. One argument put forward by some law enforcement agencies and public officials regarding their concern if torture is criminalised is that the police and military and other investigating agencies will have difficulty investigating cases. Forced confessions obtained from suspects through the use of torture, instead of investigations with the aid of scientific methods of gathering evidence, remain the usual practice by law enforcers. The law enforcement agency's inability and lack of skills to perform an effective investigation is the major factor that has led them to employ torture as a so-called means of investigation. Any effort to address the endemic problem of torture should essentially begin with the victims themselves. Victims must be assured that the violators of their rights will be brought to justice, including the prosecution of the perpetrators. Victims must also be rehabilitated, indemnified and protected. Finally, the Philippine government must criminalise the practice of torture without delay. Such an act would help lessen and prevent, if not eradicate, the practice of torture. IFSM leaders faces the local media in a press conference held June 9 at the SSU Graduate School Bldg. From (L-R) Katrina Castillo, Rev. Friar J. Calvin Bugho, Pastor Danilo delos Santos, Dr. Oliver Jimenez and Atty. Alfonso Cinco IV. "It is alarming to note that in barely 3 months, the number of reported human rights violations (in Samar) had surpassed the number of reported cases that the Commission on Human Rights had recorded for the entire year of 2004..."
The spate of disturbing events mounting day after day since the assumption of command of Major General Jovito Palparan in the 8th Infantry Division has prompted several church groups and religious institutions to immediately respond to the needs and wails of the least of our brethren in Eastern Visayas. It is alarming to note that in barely three months, the number of reported human rights violations had surpassed the number of reported cases that human rights groups and institutions like the Commission on Human Rights had recorded for the entire year of 2004. From February 10, 2005 to May 30, 2005, two hundred seventy‑six (276) cases of violations of constitutional rights and civil liberties have been reported excluding violations of international humanitarian covenants like the Geneva Conventions. In fact, statistics reveal appalling accounts: for the aforementioned time span, there were 76 cases of human rights violations per month, more than 17 cases per week and more than two cases per day. We know these are all but a chip of a logged timber. So many remain to be accounted for and documented and several have to be verified. As Christians and as a people who are compelled to respond to the poor of Yahweh, the convenors of the IFSM namely, the Roman Catholic Diocese of Calbayog, Iglesia Filipina Independiente (IFI), United Church of Christ in the Philippines (UCCP), Franciscan Justice, Peace and Integrity of Creation Office‑ Philippines (OFM‑ JPIC), Inter‑faith Movement for Justice and Peace and Kalinaw‑ Sentral Bisayas, with hearts and minds bonded in God's immeasurable love for His people, committed themselves to express their collective solidarity with the poor, deprived, oppressed and exploited of Samar. 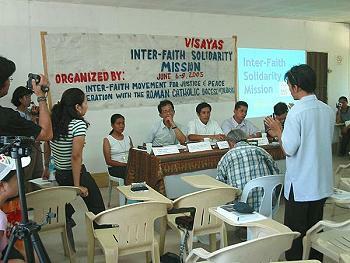 It is towards this evangelical and prophetic imperative that these groups have joined together to undertake the Visayas Inter‑Faith Solidarity Mission (IFSM) last June 6‑9, 2005 in Western Samar in coordination with the Roman Catholic Diocese of Calbayog. The IFSM was simultaneously held in the municipalities of Paranas, Motiong, and Catbalogan where relief goods were shared with 461 families from seven (7) barangays in Paranas, and four (4) families from Catbalogan. Medical services were also provided to 218 patients from Paranas and 57 patients from Motiong with cases ranging from skin diseases, eye problems, ulcers, cardio problems, among others. These, apart from the legal and documentation services rendered to numerous victims of human rights violations committed by the elements of the 8th Infantry Division and the Office of the Commanding General's 'liquidation units' such as torture, abduction and forced disappearance, coerced/forced surrender, disrespect to civilian authority, among others. Indeed, fear gripped through the hearts and minds of the victims and continues to terrify the people‑ majority of whom are the poor peasant folk struggling to earn decent lives. Some even cried their hearts out on seeing the mission. And the IFSM has given them a flicker of light and a ray of hope they have longed amidst the inaction and utter disregard by several of those who have committed themselves to public service. True enough, even the IFSM delegates have been victimized by the same people who were pinpointed by the victims and their relatives as the perpetrators of these atrocities in the hinterlands. All throughout the mission, from Tacloban City to Paranas, Motiong and even in Catbalogan, Samar, the IFSM was constantly hounded and harassed by both unidentified, bonnet‑clad, masked and motorcycle‑riding men in civilian clothing and men in uniform in full battle gear armed with M‑16 rifle, M‑203 grenade launcher. In Brgy. Concepcion, Paranas, Samar, members of the 34th IB under Lt. Cresencio Tangayan and armed men in civilian clothes wearing bonnets to hide their identity and who claimed they receive orders directly from the Office of the Commanding General, threatened and harassed not only the delegates but the peasant folk as well who attended the relief and medical mission last June 6. It was also evident that local government officials have been stripped of their authority to govern. Barangay leaders would get shouted upon by these unidentified armed men claiming that 'they only respect and implement orders from the general'; and insist that they must be informed and/or consulted on practically all matters concerning the community. In essence and in form, it is martial law at its worst not only in these places that the IFSM visited but expectedly in every community in Samar that the AFP has marked for obliteration. The people's right to a peaceful community, to a place where they are free to strive to flourish and to develop was seriously disregarded by military personnel. Many of those who have experienced these atrocities and contraventions of their human dignity and civil liberties have been uprooted and fled to urban centers where the same fate and abject poverty await. All these violate the people's dignity and honor as God's creation. All these manifest that God's 'anawim' is under siege, in agony. - Respect and uphold the supremacy of civilian authority at all times over the military as guaranteed by the Constitution. - Stop to arbitrary restrictions of basic rights, such as freedom of abode, movement, expression and peaceful assembly. - Rejection of Marcos‑style, vigilante‑type killings, abductions, and other forms of terrorist measures against legitimate people's organizations and civilians. - Stronger unity among the victims of human rights violations and the entire repressed people of Eastern Visayas to advance human rights, and frustrate attempts of the state to effect a virtual military rule over the region to pave the way for the entry of transnational mining corporations. - End now the senseless military operations causing only agony to God's people. "While we too condemn the act of ambush against the men in uniform, ...we likewise raise our voices in protest of the pro-ambush retaliations inflicted by the military against the civilians on mere suspicions that they are sympathizers of the NPA." In the last few months a gripping fear has descended upon Samar. Such fear not known since Martial Law era has spared no sector, government officials, religious leaders, local government officials, members of the academe, party leaders and worst, the peasant folks. Most fingers point to Maj. Gen. Jovito Palparan as the cause and perpetrator of this curse upon our beloved province. Whether the accusing fingers right or not, the issue is of crucial concern for us Samareños. The General claims that he has been sent to squash the NPA. While we too as a community condemn the act of ambush against the men in uniform, something we pray should not happen again, yet we likewise raise our voices in protest of the pro-ambush retaliations inflicted by the military against the civilians on mere suspicions that they are sympathizers of the NPA. Since February numerous reports of human rights violations are attributed to the military in the course of their operations. Abductions, illegal detentions, and salvaging become an everyday story. Intensified military operations in many barangays compounded by arrogant military actuations in forcibly occupying chapels and other buildings as their detachments, heightened fear such that there has been an upsurge of internal refugees particularly from the town of Calbiga. We appeal to the authorities concerned to reevaluate the policy or strategy adopted. We unite our voices with those delivered by no less than Congressman Cata Figueroa and Congressman Ining Uy. The data speak for themselves. The unjust and inhuman means do not justify the end. In fact, many from among us are tempted to think of other reasons why such events are happening in Samar. To what degree has mining become the issue? How can one explain that despite the Presidential Decree defining Samar Island natural Park just the other year, there is recently a swarming of mining applications in the province? We appeal to the military. We want to believe that you are the protector of the people. We want to feel secure when you are around. Help dispel the atmosphere of fear and restore the climate of trust by acting within the limits of the law. We appeal to our people to be courageous in defending and proclaiming the truth. As we link with Inter Faith Movement for Justice and Peace (IFM-JP) in documenting the events, we only want the truth. Let us not be carried away by black propaganda. We appeal to our people to help our neighbor-evacuees with anything we can share: food, medicine, clothing, accommodation. We appeal to our local government units to assist our evacuees. All in the name of being one big family. By airing our appeal we have only the good of Samareños in mind. We wish our people to farm with no threat to life and property. We want our people to live and move around with no curtailments to their human, constitutional, legal and religious rights. We want our people to enjoy the protection of the law. As we make this appeal we pledge to do our utmost best to protect and defend the rights especially the lives of the people, as well as the God-given natural resources of Samar which spells the Life for the Samarnons of tomorrow. We bring our appeal to the loving gaze of Mary that together with her we come to Jesus, the Prince of Peace with much hope that in His time, Peace which is development be ours too.